Ever since finding defeat with their last home console, the Wii U, Nintendo announced it was hard at work on a new console. If you too wondered whether Nintendo could turn things around then the straight answer to that is Yes. With the unveiling of the Nintendo Switch, Nintendo has turned things around pretty well. The Switch has been bridging the gap between handheld console and home console in a way the Wii U absolutely didn’t manage to do before it. It combines gaming on-the-go and gaming at home. With the arrival of top-tier titles such as Fortnite, the Nintendo Switch is a better proposition than ever. 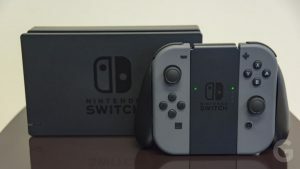 You can find out more about the Switch’s design, features, specifications, controller, performance, price range and more in the Nintendo Switch Review and Specifications. It has a bright and colorful screen. It has unique and versatile Joy-Con controllers. It has a hybrid home/portable console. It has a great range of Nintendo games. It has a poor battery life/storage. Its controller options don't feel good during long gameplay sessions. Its Joy-Cons charge only on the console without the accessory. Its right analog stick is oddly placed. It has limited online service. The Nintendo Switch is a hybrid game console. 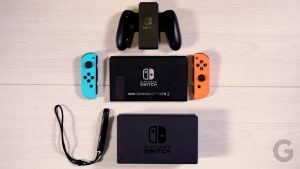 It’s designed to plug into a TV just like a PlayStation 4 or Xbox One, or it can be carried around as a portable device, similar to the Nintendo 3DS, or Game Boy. It is Nintendo’s pioneering hybrid console, giving you the best of the home and handheld console all in one convenient package. It’s the first gaming system through which you can start playing a game on the big screen in your lounge, then grab the console, slot in the controllers and continue playing on the bus or train or anywhere else until the battery runs out. While it can’t match the PS4 or Xbox One for graphics horsepower, let alone the Xbox One X or PS4 Pro. However, it has enough to run games of a similar caliber, not to mention Nintendo’s own first-party hits. 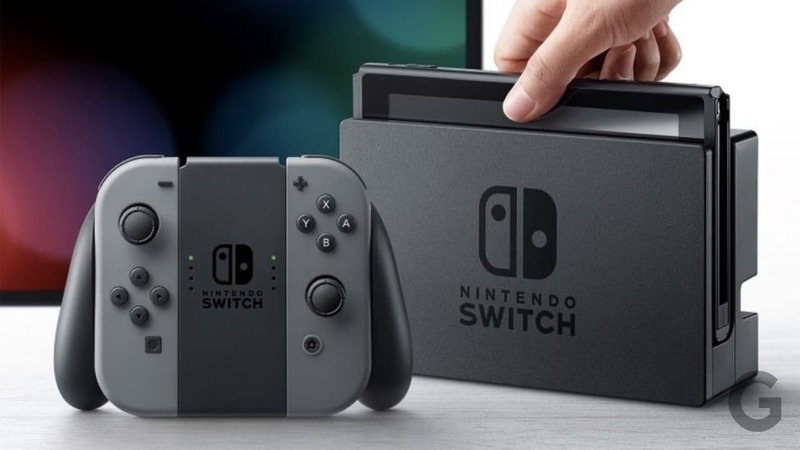 The Nintendo Switch is a small tablet with a 6.2-inch capacitive touchscreen sporting a 1280 x 720 resolution. Its construction feels rock-solid and the metal finish looks very classy. It might be the slimmest, slickest and least obtrusive console ever made. It has a hefty vent at the top for cooling purposes and a kickstand at the rear that enables you to prop up the console for tabletop gaming sessions when you’re out and about. On the outside, it has a standard 3.5mm headphone jack, stereo speakers, power and volume buttons, ports for game cartridges, a MicroSD slot for expandable storage, and a USB Type-C port for charging. It also comes with a dock, a cradle that the Switch slides into when you want to charge it or play it on a TV. The dock is effectively a hollow plastic hub that connects via the console’s USB Type-C port. It has three ports on the back, USB Type-C for charging, HDMI for audio and video output, and a USB 2.0 port. There are also two additional USB 2.0 ports on the side. The rear ports are exposed via a simple door in the back, which also hides some cords. It has somewhat of a complicated setup, so it’s worth delving into each of the different ways you can use the console. 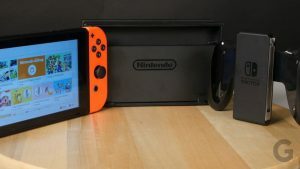 There are basically three modes in this complicated setup of the Nintendo Switch Design, namely, the Handheld Mode, the Console Mode, and the Tabletop Mode. You can read more about each of one of these in details below. In the Nintendo Switch Handheld Mode, you have to attach the two controller portions (the Joy-Cons) to the left and right edges of the screen, the game much like you do with the PlayStation Vita. In fact, the size and shape of this console’s analog sticks make it feel a lot like a modern Vita, though it’s not as solid because of the joints that exist between the Joy-Cons and the screen. Along the top of the Switch is a slot for game cartridges, a headphone jack, a volume rocker, and a power button. The bottom of the device is less busy. The detachable Nintendo Switch Joy-Cons have a lot going on. The right-hand side has the classic A, B, X, Y button configuration that Nintendo has used on and off since the SNES, an analog stick, and two shoulder buttons. There’s a small plus-shaped button acting as the equivalent of the Wii U’s ‘Start’ button, and a home button for reaching the console’s system-level menus. Across on the left Joy-Con, it’s a very similar story, as you would expect. There’s a minus button that acts as the console’s Select button, a share button for taking screenshots and video, an analog stick, two shoulder buttons, and the most unique Nintendo D-pad we’ve ever seen. Instead of the classic cross D-pad Nintendo has utilized since the NES, the left Joy-Con instead has a set of four circular buttons that are identical in shape to the face buttons on the right Joy-Con. This design decision, which appears very odd at first glance, is so the left Joy-Con can be used as an individual controller, with the D-pad acting as face-buttons in this configuration. 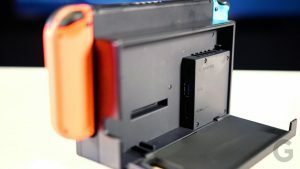 In the Nintendo Switch Console Mode, you have to place the main portion in the included dock, which connects the device to your television. You’re then free to detach the Joy-Cons to control the Switch from a distance. 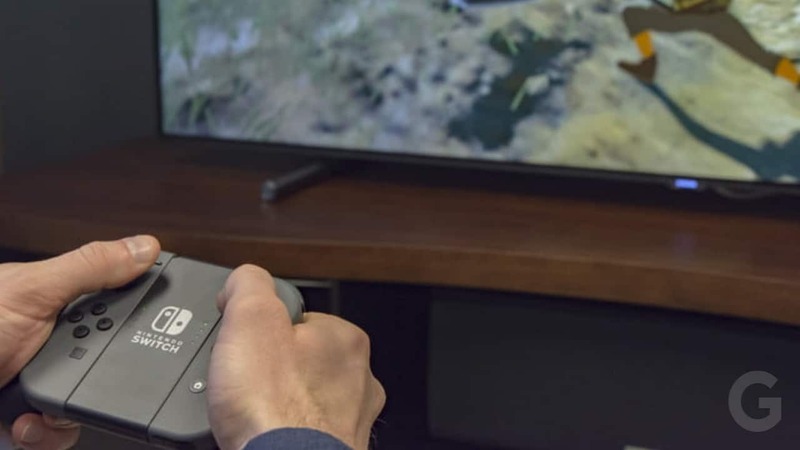 The way the console transfers the viewing experience from its own screen to the television is as seamless as it could possibly be, and you don’t even have to pause your game. Everything happens in real time. Detaching the Nintendo Switch Joy-Cons can be a little fiddly. It’s done by holding small buttons on their backs and sliding the controllers up. The TV dock is roughly the same size as the Nintendo Switch’s middle portion. Around the back, you’ve got a USB Type-C port to provide the console with power, an HDMI port to connect it to your television, and a USB Type-A port. On the left-hand side of the console are a further two USB ports, mainly used for charging your Switch controllers as you play wirelessly. If you want to use the Nintendo Switch with multiple televisions throughout your home, you can buy additional docks, which make it easy to transition from one screen to another, plug-and-play style. Completing the set of modes in the Switch is the Nintendo Switch Tabletop Mode. 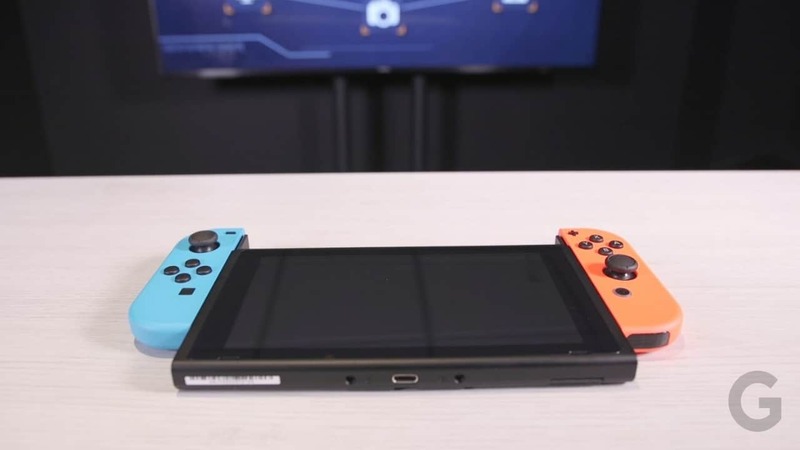 Using the kickstand that’s attached to the back of the screen, you can prop the console up on a table and then detach the Joy-Cons for some semi-portable gaming. It is perfect for long journeys on public transport where you have a tray table to place the console on. The Grip of the Joy-Cons provides just enough extra plastic to make the controllers much more comfortable in the hands. This mode is also great for multiplayer on the Switch. Detaching both Joy-Cons to allow two people to play against one another is a pleasure. There are, however, a couple of issues that prevent the console from fully capitalizing on this rather intriguing tabletop mode. First is the kickstand. Although it’s rubberized, which means that it doesn’t slide around, it only supports the console at a single height. Second is the charging port, which is inaccessible when you’re using it in tabletop mode. Finally, for multiplayer gaming, the Nintendo Switch screen is just a little too small for more than two players. Overall, tabletop mode on the Switch feels better suited to short periods of use, which is a shame when it feels like it should be the way to use the Nintendo Switch over long periods. The Nintendo Switch is a pretty impressive machine, boasting the ability to play the same games at home and on the go. The Switch dock features three USB slots, which are compatible with a wide variety of keyboards and headsets. It has the Match TV Power State option. This feature automatically turns on your TV the moment you boot your docked hybrid device. The feature also shuts down your Switch when you turn off your TV. 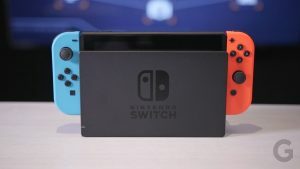 The Switch’s Joy-Cons use Bluetooth technology to connect to their respective machines and third-party devices. 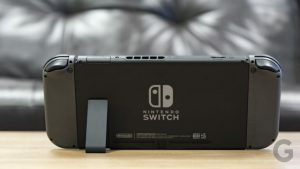 In spite of the limited battery life, Switch can hold external batteries which can extend the system’s lifespan significantly so long as each device has a USB-C connection or utilizes an adapter. There are a variety of batteries on the market right now that are compatible with the Switch. The Switch hasn’t launched its online service yet and what’s currently in place is pretty ropey. You can add friends you’ve met on Nintendo’s mobile apps or use those dreadful, old-fashioned Friend Codes, but Nintendo Switch features to add people more organically or using social media still haven’t emerged. It also seems bizarre that you have to use a smartphone app for voice chat and game invites. The Switch has two detachable controllers called Joy-Cons which have all the controller buttons and slide onto the tablet. These slide into the rails on the side of the Switch with a satisfying click, sliding out again when you press a button on the rear of each controller. It can be used to control games in many different ways. The small, remote-style controllers slide and snap into place on either side of the Switch, turning it into a handheld gaming device to Nintendo’s Game Boy and 3DS systems. The Joy-Cons feels sturdy and has a matte finish makes the console look and feel modern. Its weight isn’t very much, it is light enough to hold for long stretches in portable mode. There are two Joy-Con straps, and the Joy-Con Grip that fuses the two Joy-Cons together as a single controller. 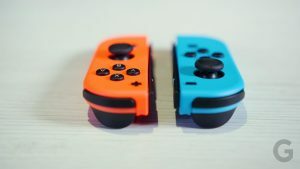 When the console is connected to its dock, or if you simply don’t feel like holding the whole console, you can use Joy-Cons freely or slot them into Joy-Con Grip, which turns them into a conventional controller. The Grip works like any other gamepad, but it’s much smaller than the PS4’s Dualshock 4 or the Xbox One controller. The Nintendo Switch Controller has small control sticks and therefore have a hard grip. The Nintendo Switch can be used on the go, it’s not quite as portable as Nintendo’s 3DS. Its battery life ranges from 2.5-6 hours in portable mode, depending on the game. It won’t last through most flights, though it’s fine for the commute to work. The Switch also doesn’t fold up to protect its own screen, as does a 3DS, so you should consider a carrying case. 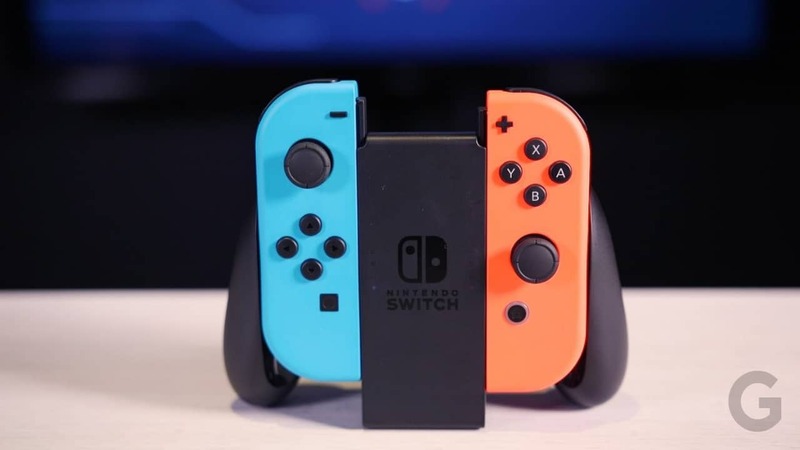 The capacitive touchscreen and touch-friendly UI makes the Switch a joy to use, and whether you’re starting a game, changing settings or browsing the eShop, it’s easy to get around. You can switch between users quickly, the Switch supports up to eight. The home screen adapts to display the most recent games you’ve played. One of the limitations of the Nintendo Switch Performance is that it doesn’t have any real app ecosystem as there is on the Xbox One and PS4. You can’t even watch video-streaming services like Netflix on the go while using the Switch. It is a Nintendo machine made for playing Nintendo games. Despite all the measures taken to make it feel more mainstream, its flaws reveal that the console was designed so that Nintendo’s developers could make interesting games. 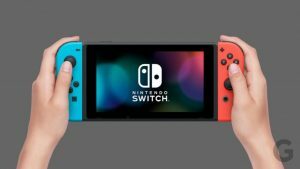 The price of the Nintendo Switch is higher than all other handhelds developed by the company till date. The flagship console of the Nintendo is priced at $300. The Joy-Con is an optional accessory that comes with the Switch. It is a great gamepad priced at $70. If you play competitive games or play for long stretches at a time, you would like to shell out for Nintendo’s Pro Controller. If you want to go for alternatives then at $150 the New Nintendo 2DS XL is the one you can really go for. 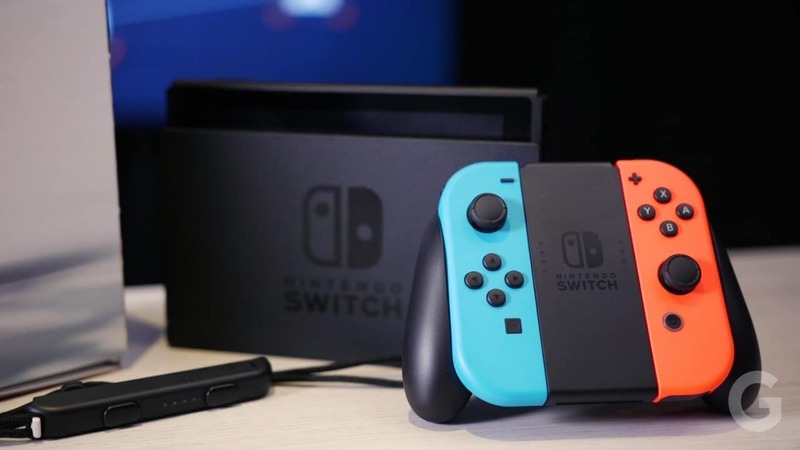 🏆 If you have used or if you are using this gaming console, please leave your Nintendo Switch review in the comments below and help our readers choose.